Republican Michael Williams is polling last place in Georgia’s GOP gubernatorial primary, and in a hilarious turn for the worst, his Deportation Bus Tour appears to be having a little trouble – just like his campaign. In a 58-second advertisement released Tuesday, Williams stands in front of the “deportation bus” and shares his campaign promise to “fill this bus with illegals and send them back from where they came from.” The rhetoric matches the campaign style of President Donald Trump, who called citizens of Mexico “drug dealers, criminals, and rapists” in his first-ever campaign speech. Written on his campaign bus, Williams refers to undocumented immigrants as “murderers, rapists, kidnappers, child molesters, and criminals” on the rear of the bus, just above a call to elect him governor. However, as The Atlanta Journal-Constitution reported, just like his campaign, Williams’ tour hit an unexpected snag. Williams’ “deportation bus tour” hit some speed bumps Thursday in a quest for attention and outrage in the closing days of the primary for governor. 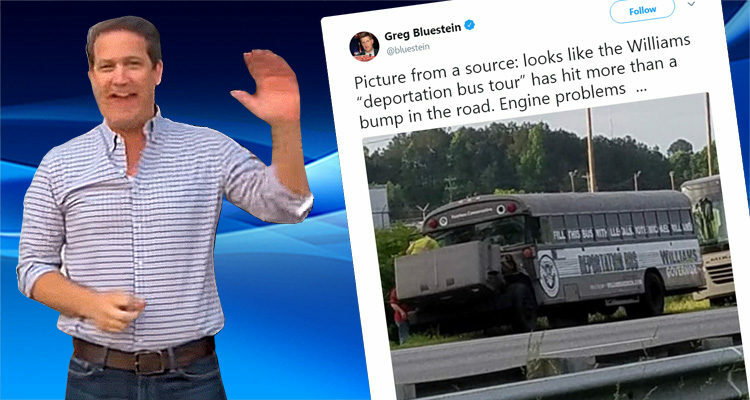 The grey-painted vehicle, emblazoned with “fill this bus with illegals,” broke down early Thursday in between stops in north Georgia. Critics took to social media to compare the sputtering engine’s plight to his longshot bid for governor. And that isn’t the first snag in his tour – thankfully. The restaurant chain Cracker Barrel, meanwhile, notified Williams that his bus was prohibited from campaigning outside its restaurants, citing a policy not to host political events. Several stops on the bus tour were to take place at the restaurant’s locations. “We are not sponsoring this event or supporting Mr. Williams’ campaign stops in any way, and per our company policy, we will not allow him – or any political candidate – to host an event on Cracker Barrel’s property,” the restaurant said in a statement.